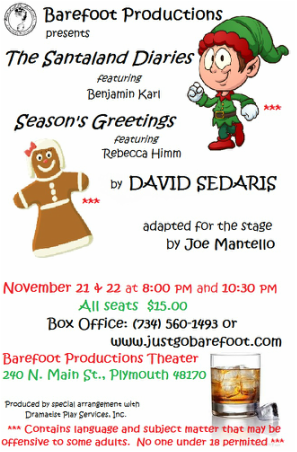 Barefoot Productions is excited to present a very special kick-off to the holiday season with a two night only, hilarious performance of David Sedaris' The Santaland Diaries / Season's Greetings. Adapted from Sedaris' popular writings, from his book Holiday on Ice. The Santaland Diaries is a one man performance, featuring Benjamin Karl (Redford), as an Actor/ELF that has the real scoop on what it is like to be a Macy's Elf in 'Santaland'. Ben Karl, plays David (based on Sedaris himself), a New York actor, who takes a job as an Elf at Macy's Santaland. Karl's performance is filled with spontaneous insights delivered with great comic timing. The second piece of the evening is Season's Greetings, a one woman performance, featuring Rebecca Himm (Northville), who plays a suburban housewife writing her annual Holiday letter, filled with merriment, tragedy and insanity. The script, written by David Sedaris and adapted for the stage by Joe Mantello is filled with the sarcastic humor that makes Sedaris nationally famous. His biting wit brings brutal honesty to the words of both performers. The Santaland Diaries / Season's Greetings is performed all over the country, as annual performances by many theater companies. Barefoot Productions hopes it's productions will also become an annual event.